July 25, 2012: We are cycling up a narrow country lane to the ridge at the top of the Downs. It is early evening. There isn’t a cloud in the sky. The air is soft and warm after a day of baking sun. There are six of us: my 21-year-old nephew, Taylor, my sister, Amanda, and her friend Anne-Claire, my 14-year-old son, Kadian, his schoolfriend Rori, and me. As Kadian climbs the hill I call from behind, encouraging him to practise his turning signals. He puts his right arm out and the bike wobbles in the same direction. “You need to lean to the left when you signal right,” I shout from behind. “Try it.” He does, and it is marginally better. When I tell him to do it again, he grunts in disgust and, pressing hard on his pedals, pulls away from me up the hill. We’re staying at my parents’ house in Mildenhall, a village just outside Marlborough in Wiltshire. Our plan is to cycle 10 miles west, to my uncle and aunt’s thatched cottage, for a family dinner. The journey will take us up and across the Marlborough Downs, a chain of grassland chalk hills that separates the county of Oxfordshire in the north from Wiltshire in the south. Along its top runs an ancient footpath, known as the Ridgeway, and it is this that we intend to follow. We continue our way up the lane and the vista opens. There is a field filled with golden wheat on our left. Another speckled with grazing sheep and Neolithic stones. Below us a grassy slope drops away to fields etched with terraces. The ringed mounds of ancient hill forts can be seen in the distance. The sun, sitting low in the sky, splashes amber light across the landscape. “It’s so beautiful here,” Kadian says as I pull up to him. “It’s so beautiful,” he repeats with a dreamy smile. We wait for the others to catch up, then head off the lane onto a stony track that descends gently down to a large stack of hay bales. The trail ends abruptly, which is strange. Kadian goes first, and the rest of us follow. Soon we are riding along a narrow path through a tunnel of trees. Kadian, still in front, calls back, “It’s muddy, it’s muddy,” in a not-very-believable but still funny northern accent. The path opens into a broader track. It’s a little gravelly, steeper. The gap between myself and Kadian widens. I notice this, the information sliding through my mind without traction as I grasp my brakes to slow my descent. He’s suddenly way ahead of me — 100ft perhaps. He must have gathered speed. Then there’s a flash of a white van, moving fast from left to right, at the bottom of the slope. It shouldn’t be there. And the van hits Kadian. Driving him away from view, away from me. Moments later I’m at the road. I drop my bike to the ground. I’m screaming before I see him. He’s lying facedown on the side of the road, near the white line. His head is tilted to the left; there is a small pool of blood by his mouth. I can’t see his bike. He is still. Absolutely still. He doesn’t look like Kadian any more. He looks vacant. He looks like he is six or seven years old. But what strikes me the most, more than the blood, or the lack of movement, are his eyes. His pupils are dilated unnaturally wide. I know he’s gone. I know he is dead. I know that I have lost my son. My Kadian. This is real. This is happening. I can’t believe it. I’m crouching a few feet from him. Wailing. My head in my hands. And wailing. No. No. No. I don’t want to touch him. I don’t want to cradle him in my arms. I want to roll back time. I am both in my body, rocking, howling, and high above, looking down on this dreadful scene, feeling oddly sorry for the father who has just lost his son, suddenly, tragically. I realise that this is the A4, the road running from Marlborough in the east to Avebury in the west. But there is no traffic. Everything has stopped. A man in a dark green RAF flight suit runs up and squats down by Kadian. I don’t know where he has come from. Could an ambulance have arrived already? Who would have called them? My brain cannot make sense of this collapsed world. “Is it OK if I turn him over?” he asks. How am I meant to know? I realise it won’t make a difference, but the man’s question makes me wonder, is there hope? I nod. Cradling his head, he gently pulls one side of Kadian’s body over so that he is staring at the sky. He takes out a phone. He’s talking to the emergency services. These images flick through my brain. I notice I am not holding him. I notice I am not trying to resuscitate him. I notice I know there’s no point. My brain is observing, detached, helplessly trying to catch up. My sister arrives. She squats down and holds my head, tight. I think for the first time about my wife, Debora, of having to tell her. I start wailing again. No, no, no. It’s been about two minutes since the accident. “I need to call Deb,” I say to my sister. It’s as though I am standing at the edge of a well. I am out of my mind, all is quiet, nothing is moving. I lean towards the deep hole. Something clicks in my head, and I realise I have to make sure there is someone with Deb when I tell her what has happened. Deb is away in America. She is the CEO of a bicycle business. I call her office in Washington. I ask to be put through to the general manager, Gin. “She’s gone out. To the post office, I think,” says Gin. She is calm. She agrees, and says she will have Nate there as well — the young guy who runs the head office. A few minutes later, I call again. I am put through. I’m over the edge now, about to lose my balance. How can I do this to her? “Is he dead?” she asks, her voice louder. I can hear that she is crying. “Who are you with?” She is trying to fill in the details. Then the phone cuts out. I have lost reception. Sam. Our daughter Sam. Where is she? I have no idea. Perhaps she is with my parents. How am I going to tell her? I hand the phone to my sister, who tries to call Deb back. And then I realise how long it will be till she arrives. It is just past six in the evening; even if she catches the next flight, she won’t be here until six or seven the next morning. I can’t believe she isn’t with us now. I can’t believe that she has to wait, that I can’t comfort her. I am now sitting on the kerb. Kadian is still lying on the black tarmac, 30ft away. The ambulance arrives. Three men walk towards him, very slowly. They lift him into the ambulance, close the doors. There is a finality about this. He is there. I am here. A policeman walks up to me and introduces himself. He tells me his name, PC James Trafford. He looks young, nervous, unsure. “I am so sorry,” he enunciates, slowly, as though speaking to a foreigner. A bright-orange medevac helicopter arrives. It lands on the A4, its rotors beating the air. The helicopter paramedics walk to the ambulance. I look up to my right and for the first time I see the white van parked 100ft up the road. Between the van and the kerb sits a young man, with short curly hair, perhaps in his twenties. He is by himself, staring at the ground. “Is that the driver?” I ask my nephew. “I think so,” he says. I stand up and walk towards him. My nephew tries to stop me, but I tell him it’s OK. PC Trafford now hurries after me, but I get to the driver first. The driver turns as I approach and stands up. I put out my hand; I am not sure if he will take it. He does. “I am the father,” I say, oddly calm, in control. “I just want you to know it was not your fault.” The driver looks at me, doesn’t move. I turn and leave before he has a chance to respond. I have said what I needed to say. Some time later a man comes towards me wearing a bright-orange jumpsuit and a walkie-talkie attached to his chest. He crouches down next to me. I know what this is. I have seen it enough times on TV. “He’s dead, isn’t he?” I ask. All I can do is shake my head. Left and right. Left and right. I must speak to Deb. And then she screams. And screams. I keep the phone to my ear. This is real. This is happening. I am numb. I can still hear the screaming, a long, continuous guttural scream of pain, but it is distant now. Perhaps Nate has walked to another room. “Nate, you’re going to have to figure it out.” And I hand the phone to someone, I cannot remember who. Cycling was always a part of our family life. I had worked as a bicycle courier in London after I left school. Deb ran a chain of bike stores. We had met on a bicycle ride. When they were young, we pulled the kids around in a bicycle buggy. When they outgrew the buggy, we used it to pick up groceries. Kadian cycled to school each day. Sam’s first big purchase was a bright-red Italian racing bike. We went on long family bike rides together. Thirteen bikes were hanging in our shed. Bicycle posters adorned the walls of Kadian’s bedroom. Why did this happen? Kadian was an experienced cyclist. Nobody else had difficulty stopping in time. He must have seen the road ahead, he was at least 300ft away from the intersection when he had first emerged from the trees. Why hadn’t he stopped? Was it the brakes? We had been worried that they hadn’t been working properly, but Kadian had gone to a bike shop to have them fixed that day. They couldn’t have failed. We didn’t know what to call Kadian when Debs was pregnant. After it was confirmed at our first scan that he was a boy, we purchased a couple of name books and for a few days mulled over Christopher, Bartholomew, Wilbur, but nothing fitted. Then one day, Deb met a woman on a train. The woman had spotted Deb’s bump and they got to talking about names. 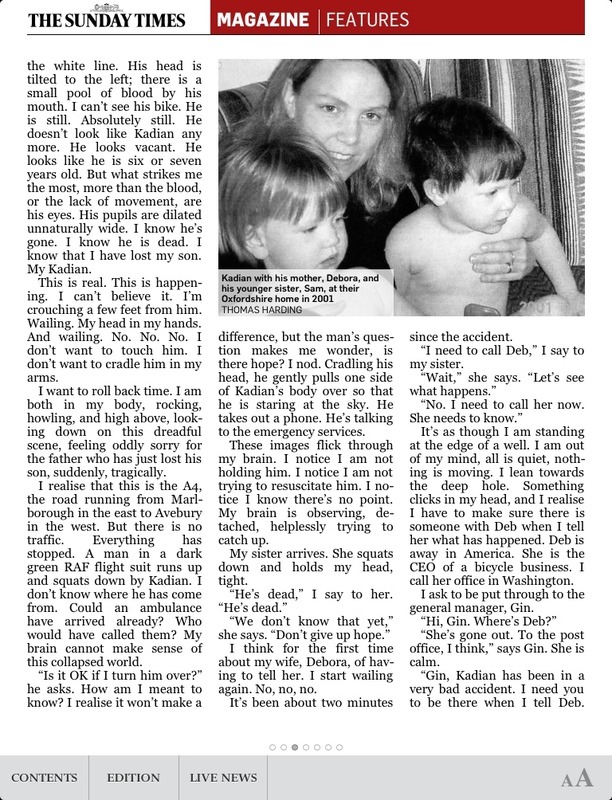 The woman said that she had only daughters, but had been saving a special name for a boy. “Kadian,” she said. “It’s Jamaican. It means cheerful and charming.” And from the very start, he was. He smiled at his mother when the nurse first handed him over. He smiled on the changing mat. He smiled at the doctors, even as he was put on a cold metal weighing scale. As the weeks progressed, his cheeriness only intensified. Gurgling happily in a blue sling as we walked down the street. Chortling as he slithered his way for the first time across the living room’s hardwood floor. Laughing as he spooned his own mashed bananas into his mouth, dropping most of the goop onto his Tigger-patterned onesie. He was great company as a baby. His equanimity and joy of life were a gift. Deb and Kadian had a remarkable relationship. He had a strong need to spend time with his mother. At the age of three, he began playing the piano. At four he started with the Suzuki Method, which required that he and Deb practise together every day. This continued until he was 10, when Deb said he needed to practise by himself. He composed his own songs and performed them at school. But he hated practising alone and eventually stopped. When the piano lessons had long stopped, the lizards and toads had all passed away, when the Lionel trains had been sold and the Lego stored away in boxes or handed down to a younger cousin, Kadian looked for another activity to share with Deb. Finally, it dawned on him. Bicycles. July 26, 2012: The alarm on my iPhone goes off. It is 5.45 in the morning. Deb is arriving on the seven o’clock flight from Washington. How will Deb be? She has flown over with Dominic, our very close friend. He had been at home in Shepherdstown, West Virginia, when he received a call from her, about an hour after she’d learnt that Kadian had died. At the airport I sit in the middle of a row of moulded black plastic chairs. Then the large double doors swing open and there is Deb, with Dom. Our eyes meet, her lips wobble, all the strength I have flows out of my legs, I can’t move. Her being here makes it real. She is still on the other side of the arrivals barrier, then we are holding each other. “I can’t believe it,” she is saying. “I’m so glad you’re here,” I say. “What are we going to do?” she asks. “What are we going to do?” I say. “Is he really gone?” she asks. “I can’t believe it,” I say. Two policemen stand close by. I hadn’t noticed them until now. Apparently they had escorted Deb and Dom from the plane, sped them through passport control, trying to make it as easy as possible, given the circumstances. “Given the circumstances”: a phrase which was to be repeated often over the next few months and is one of my least favourite English expressions, for it is so vague, yet hints at indescribable horror. Dom gives me a hug. “I’m so sorry, brother,” he says. Tears are in his eyes. I thank him for being with Deb. He tells me she was amazing on the flight. Talked most of the way, recalling Kadian stories, special times together. She didn’t sleep more than a few minutes. Deb says she wants to go and see Kadian as soon as possible. We drive to Swindon General Hospital, an ugly concrete block on the edge of the town. Deb asks for some time alone with him. After 10 minutes she comes out. I stand, realising I also want to say goodbye to Kadian. This surprises me. I walk through the door and I am suddenly alone with my dead son. My first thought is that this is so strange. That he is not moving. That he is no longer alive. I step to the left of him, put my hand on his arm, and look at his face. I am astonished that I am talking to him, I know he is dead, that he cannot hear me, that I am speaking to an empty room. A moment comes back to me from the ride. Just before he headed down the narrow wooded path, Kadian said, “You are the worst navigator in the world,” in a jokey, teasing tone. I was the worst navigator in the world. I had the map, I had got us lost, I had allowed my 14-year-old son to cycle down a path towards a road where cars and vans sped by at 60 miles an hour. What the f*** was I thinking? “I’m sorry, Kads,” I whisper, crying. “I’m so sorry, I wish I could have protected you. I failed you as a father.” I am confused by this confession of guilt. Where has it come from? And I am terrified of where it might lead. Do I really feel responsible for his death? How am I going to be able to live with that? Is it really my fault? I lean over and kiss him the way I did each night, when I tucked him in: forehead, chin, left cheek, right cheek, then finally, I wiggle my nose against his. It feels cold. Cold. I look at him for a few moments longer. “Bye, Kads,” I say, and then again: “I love you. Best son in the world.” I wait for him to give his usual reply: “Best father in the world.” He doesn’t, and I walk out. Deb and I drive back to the scene of the crash. PC Trafford is there, talking to the man in the RAF flight suit. “This is Richard. He witnessed the accident,” he says. Back at my parents’ house, I send Dominic and another friend to visit the bike shop in Marlborough, where Kadian had taken his bike to have his brakes fixed before the ride. An hour later they return. The shop owner said he remembered working on the brakes, and gave Dominic a receipt confirming it. The inquest is held in Salisbury. At first the coroner affects a tone of camaraderie, of one parent talking to another. Then he turns adversarial, harsher: tell me about the purchase of the bike. Tell me about the assembly. The final ride. The conditions. The route. He asks me if I had a compass, and if not, why not. He chides me for getting lost that day — why didn't I use the position of the sun to determine that we were following an incorrect route? Witnesses come and go. When the bike-shop owner takes the stand he looks anxious, his fingers nervously clutch at the glass of water on the table. He denies working on the front brake but then assures the coroner that, before he released the bike to Kadian, he had tested both front and back brakes. The coroner declares a “narrative verdict”, meaning he is not attributing cause to any named person. He accepts the bicycle shop owner’s statement. He rejects our request for a system that requires all bicycle mechanics to qualify prior to employment, saying he does not believe the government should create further regulations for small businesses. He also rejects the RAF officer’s request to have a warning sign put on the path. He says road signs can actually cause injury, as people might ride into them. Finally, he comes to the issue of bicycle failure. He reports that he believes the front brake had experienced a “catastrophic failure” and that the back brake wasn’t working sufficiently as there was no evidence that the bike had slowed down or that it skidded. Both brakes had failed.